Here, at last, is a book brimming with the good news of raising children—the basic reassuring news about happiness and unconditional love, about enduring family connections and kids who grow up right. Edward M. Hallowell, M.D., father of three and a clinical psychiatrist, has thought long and hard about what makes children feel good about themselves and the world they live in. 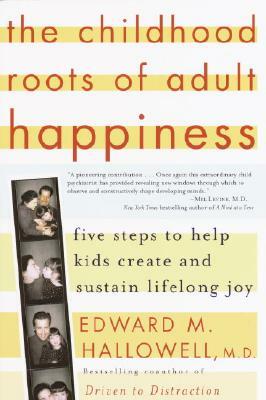 Now, in The Childhood Roots of Adult Happiness, Dr. Hallowell shares his findings with all of us who care about children. As Dr. Hallowell argues, we don’t need statistical studies or complicated expert opinions to raise children. What we do need is love, wonder, and the confidence to trust our instincts. This inspiring book outlines a 5-step plan that all parents can use in giving their children the gift of happiness that will last a lifetime. Connection, play, practice, mastery, and recognition: as fundamental as these five concepts are, they hold the key to raising children with healthy self-esteem, moral awareness, and spiritual values. Dr. Hallowell explores each step in depth and shows how they work together to foster trust, respect, and joy. Privilege, wealth, and expensive “extras” are not necessary for happiness—there are many stories here of children who have overcome poverty, abandonment, and shocking deprivation to find true fulfillment. Dr. Hallowell encourages us as parents to reconnect with the moments in our own childhoods that made a difference; he explores the impact of genetics and environmental factors on the inner workings of a child’s mind; and he discusses how activities like team sports, community service, religious observance, and household chores can foster a child’s sense of mastery. Like the works of T. Berry Brazelton and Benjamin Spock, The Childhood Roots of Adult Happiness is infused with the wisdom and humanity of a doctor who truly loves and understands children. Writing with the warmth of a friend and the authority of an expert, Dr. Hallowell gives us a book at once practical and exuberant, joyous and informative, eye-opening and reassuring. Ultimately, this book is a celebration of childhood and of the magic that happens between parents and the children they love. Edward M. Hallowell, M.D., was an instructor at Harvard Medical School for twenty years and is now the director of the Hallowell Centers in Seattle, San Francisco, New York City, and the Boston area. He is the co-author of Driven to Distraction, Delivered from Distraction, and Answers to Distraction, as well as the author of CrazyBusy, The Childhood Roots of Adult Happiness, and Worry, among other titles. He also hosts a weekly podcast called Distraction that offers practical solutions on how to focus and regain control in today’s digital world.